Check your kitty's skin for lumps every week. Lumps under the skin are a part of life for cats. You may be alarmed to find a bump under your pet's skin, but subcutaneous nodules often are innocuous growths that pose little danger. You should schedule a vet visit though, because some nodules are related to serious health problems. Cats of all ages can suffer lumps under their skin, but the development of nodules is much more common in old animals. Roughly 30 percent of feline tumors occur directly beneath the skin compared to those that grow internally, according to University of Illinois College of Veterinary Medicine. Outdoor cats are more likely to have nodules, because they are more likely to get injured or contract a disease. Nodules can be as small as a pea or large and expansive, covering several square inches of skin. Small nodules may appear individually or in clusters. There are all sorts of subcutaneous nodules. Lipomas and panniculitis are two examples of fatty tumors, which aren't cancerous at all. These growths often are prominent and felt easily with your hand. 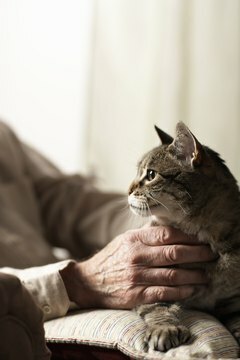 Basal cell tumors and carcinomas are slightly malignant growths common in older cats and long-haired breeds, like the Himalayan and Persian, according to The Merck Manual for Pet Health. Fluid-filled cysts are hard to the touch, so they may seem like tumors when they actually are isolated and benign growths. While old age and breed can increase your cat's chances of hard nodules developing under his skin, there usually is an underlying cause of the lumps. Cysts and fatty tumors can emerge without cause, but they usually are associated with minor physical injuries and skin infections. Infected hair follicles and collections of keratin-coated skin cells also can lead to subcutaneous nodules. Cancer can cause nodules to appear all over your pet's body, while some tumors simply are isolated malignant growths. Sarcomas, a type of cancerous nodule, are a rare side effect of vaccinations in cats, according to Cornell University College of Veterinary Medicine. Most nodules are not a big deal. In fact, the vet may recommend no surgery or treatment for a benign tumor at all, because the risk of surgery outweigh those of the growth. You always should take your kitty in for an appointment if you find a nodule though, because removing cancerous growths early could save your pet's life. Your vet will examine the growth and take a sample of it with a needle or biopsy. After examining and testing the sample, he will give you the diagnosis. Surgery may be the best option depending on the type, size and location of the nodule. Always consult an experienced veterinarian regarding the health and treatment of your pet. Do Cats Usually Get Their Shots in the Neck?